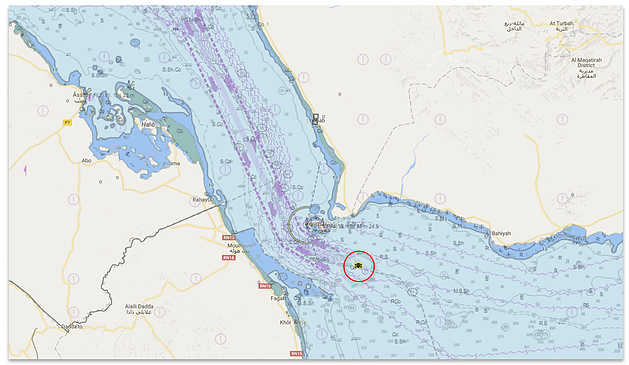 Following an investigation into the incident against the Spanish registered LNG tanker GALICIA SPIRIT, Teekay has announced that the skiff that engaged the vessel was carrying “substantial amount of explosives”. The intention of the attackers is unknown but the “explosives would have been sufficient to have caused significant damage to the vessel. It appears, however, that when the skiff was approximately 20 meters from the vessel, the explosives detonated, destroying the skiff and ending the attack”. 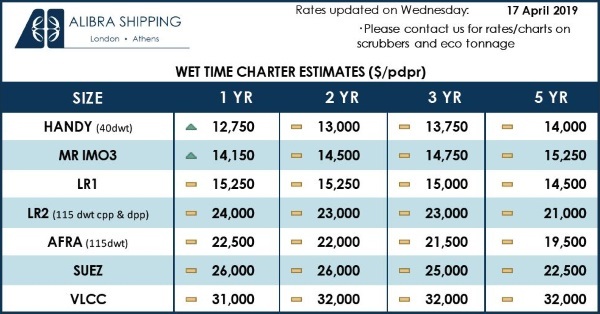 The damage or destruction of an LPG or LNG vessel such as this in such a strategic area for sea borne commerce would be a ‘spectacular’ sending shock waves across the world. Vessels transiting high risk areas will generally have ship hardening measures in place to deter a boarding by pirates, such as Razor Wire around deck edges and railings, fire hoses that disrupt small craft trying to get alongside and a citadel (a safe room) pre-prepared with communications and emergency supplies for the crew to hide out and await military rescue. Advice is provided to the industry in BMP 4 (Best Management Practices 4). However ships companies will need to review measures to take in case of a directed attack from a small boat crewed by persons intent on their goal and laden with explosives. ASKET are reviewing and happy to provide free advice on a case by case basis. Due to the nature of the cargo, Gas Carriers are very well built and the inherent safety features are substantial. They are built with a double steel hull forming a void space between of around 3 metres. On LNG carriers the outer walls of the tanks are made of concrete and the inner tank of high alloy steel with a space between filled with insulation material protecting the liquefied gas inside. There is always a danger of a follow on explosion if the hull and containers are breached by an Terrorist Bomb. The devastation that a bomb packed into a small boat used against a larger vessel can cause was proven when on 6 October 2002, the Limburg was carrying crude oil from Iran to Malaysia, was rammed by suicide bombers in explosives-laden dinghy into the starboard side of the tanker. 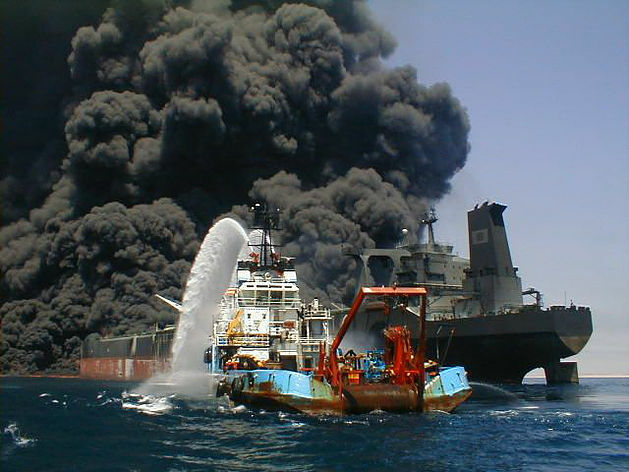 Upon detonation the vessel caught fire and approximately 90,000 barrels (14,000 m3) of oil leaked into the Gulf of Aden. By exploding the oil tanker in Yemen, the holy warriors hit the umbilical cord and lifeline of the crusader community, reminding the enemy of the heavy cost of blood and the gravity of losses they will pay as a price for their continued aggression on our community and looting of our wealth. 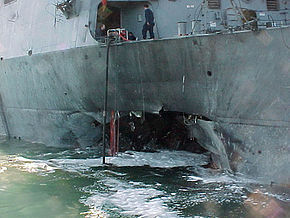 The USS Cole was struck in Aden Harbour, Yemen on 12 October 2000. 400 to 700 pounds 180 to 320 kg (Around) of explosive were used, causing substantial damage and the deaths of .Seventeen American sailors and 39 injured. ASKET is the worlds largest independent security broker, focussed on providing high quality, competitive brokerage services, with a human touch. We work for the shipping industry providing advice and guidance when helping them to select maritime security teams from a range of ASKET Approved Private Maritime Security Company (PMSC) suppliers. 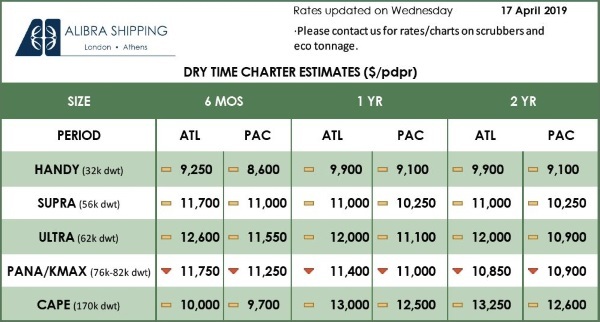 We support fleets both large and small whether spot transits or regular voyages. Our team monitors the threat for each client transit, manage the quotation process with appropriate PMSC’s and deliver a selection of compliant quotations for clients to make informed decisions about which security team to engage. We help Clients save time, money and help improve the quality and compliant nature of the security solutions they receive.